Flooding In Iran Kills At Least 70, Forces Evacuation Of Thousands Record rainfalls over the past two weeks have killed people across 13 provinces. Forecasters expect heavy rain to continue over the next few days, forcing the evacuation of regions bordering Iraq. 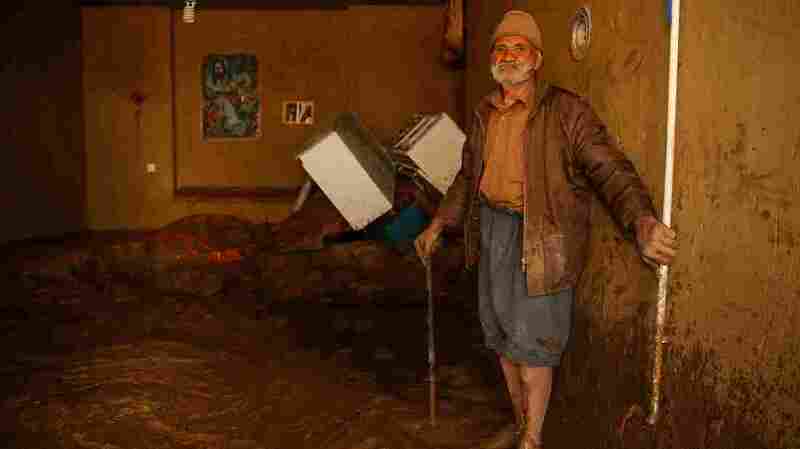 A man stands in mud in the city of Mamulan in Iran's Lorestan Province. Heavy rain and unprecedented flooding has killed at least 70 people in Iran since mid-March. Flooding in Iran has killed at least 70 people, and forced the mass evacuation of thousands, as heavy rain continues to fall on much of the country. Mansoureh Bagheri, Director of International Relations at the Iranian Red Crescent Society, spoke with NPR from Tehran, Iran. "Since March 16, we've started three rounds of rainfall in Iran. It started from the north part of Iran, and I can say it engaged the whole provinces. Out of 31 provinces, almost 24 provinces have been impacted by the severe rainfall," Bagheri said. The floods occurred during Iran's new year holiday of Norwuz, and left many stranded. The state-run Islamic Republic News Agency reports floods killed people across 13 provinces. According to IRNA, "The disaster began with heavy rainfalls in the northern provinces of Iran since March 19, and continued across Iran with flash floods in southern, central and western provinces." Iran's Mehr News Agency reports some 1,900 cities and villages have been flooded, "causing hundreds of millions of dollars of damage to Iranian water and agriculture infrastructures." Bagheri told NPR, "The destruction is high. I can say regarding the agriculture, regarding the infrastructure, regarding the livelihood, the impact is high." CNN reports more than 140 rivers have burst their banks; 409 landslides have been reported; 78 roads have been blocked; and 84 bridges have been affected. Iran's Foreign Ministry has said U.S. sanctions on Iran are blocking humanitarian aid to flood-hit areas. FAKE NEWS: @SecPompeo claim that US "ready to assist @ifrc, which would direct money through Iranian Red Crescent for relief"
"These floods once again show the level of Iranian regime mismanagement in urban planning and in emergency preparedness. The regime blames outside entities when, in fact, it is their mismanagement that has led to this disaster," he said. "The United States stands ready to assist and contribute to the International Federation of Red Cross and Red Crescent Societies, which would then direct the money through the Iranian Red Crescent for relief." Bagheri told NPR sanctions are having an impact on donations to the IFRC. "The sanctions actually impede their receiving international donations from the international community, and also from Iranians living abroad," he said. Al Jazeera reports that dozens of villages and towns in southern Iran have been evacuated as authorities issue warnings for more flooding in regions bordering Iraq. According to Al Jazeera, Iraq officially closed the Chazabeh border crossing after Iranian authorities banned travelling and trade through the border in the southern province of Khuzestan.